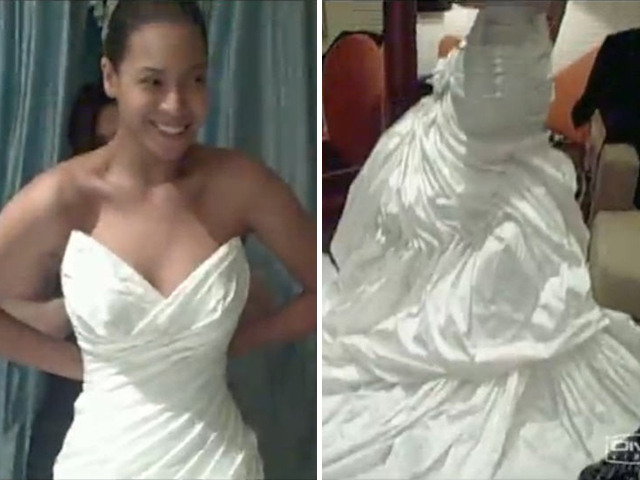 (CBS) Beyonce and Jay-Z's 2008 wedding was kept under wraps, but the singer is now showing off one major detail from her big day. The Grammy winner, who is currently expecting her first child, gives a glimpse of her wedding gown in her new music video for "I Am Here." The video shows clips from throughout the singer's childhood and career. The gown, which features a sweetheart neckline, fitted bodice and dramatic train, can be seen at the 3:36 mark. Tell us: What do you think of Beyonce's gown?